There is nothing that make my mornings happier than knowing that I have a healthy breakfast all ready to go when the kids and I wake up. 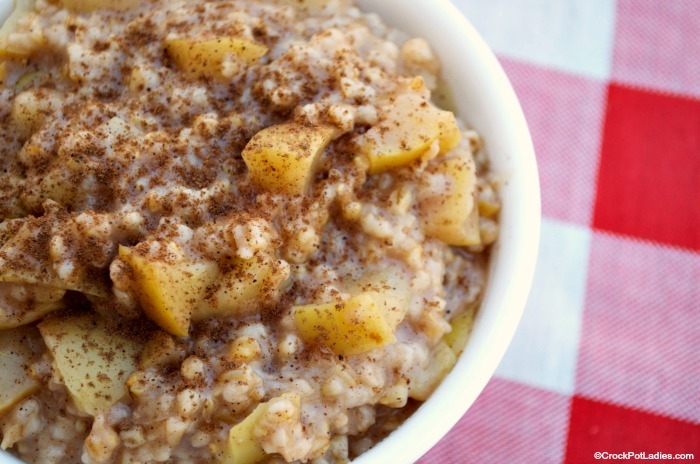 And this recipe for overnight apple pie oatmeal made in my slow cooker fits all the requirements for me. Not a lot of prep work involved…just measuring out the steel cut oats, water, and spices and then chopping up a couple of apples. 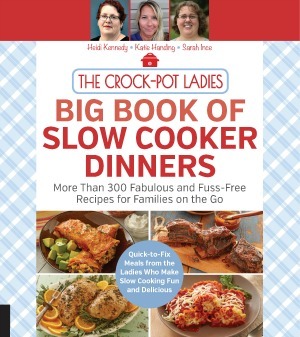 You basically just throw everything in your slow cooker and let it do it’s thing while you sleep. Now if only everything else were that easy right? 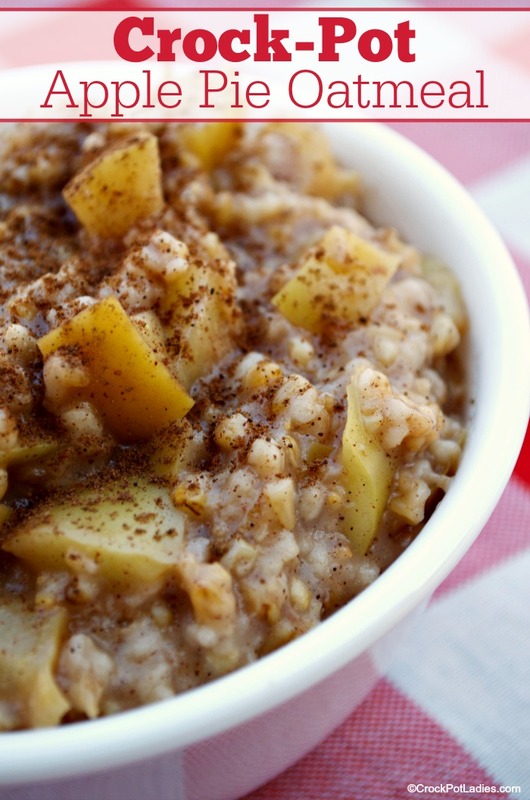 When making oatmeal in your crock-pot the key really is to use steel cut oats. Other kinds of oatmeal like instant oatmeal, quick cooking oatmeal and even old fashioned rolled oatmeal tends to get mushy when cooked for any length of time in the slow cooker. But not good and hearty steel cut oats! Because they are less processed they hold up their texture beautifully in the long cooking environment. AND as a bonus…they are healthier for you too with more nutrients and fiber than other forms of processed oats. If you are on a gluten free diet we recommend using a brand of steel cut oats that is gluten free. While oats in general are gluten free, not all brands are in fact labeled as gluten free. We really like McCann’s Steel Cut Irish Oatmeal. They are easy to find and are indeed labeled as gluten free. This recipe contains no added sweetener. I found it to be plenty sweet with just the apples. However feel free to sweeten the oats to suit your taste with sugar, honey or your favorite sweetener. 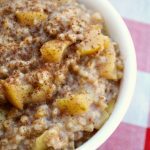 Wake up to the heavenly smell of apple pie in oatmeal form with this easy to prepare overnight steel cut oats recipe! Add all of the ingredients to a 4 quart or larger slow cooker and stir everything together to mix. Cover and cook on LOW for 6 - 8 hours. This recipe was first published in January 2017. And we have decided it was time for an update. New photos, as well as special diet and nutritional information has been added. We hope you enjoy! If I decide to add sugar, how much should I put in? We suggest sweetening with sugar or other sweetener after it is cooked and adding to suit your taste. Some folks may like it sweeter than others. I would start with 3 tablespoons of sugar, stir that in, taste it and add more 1 tablespoon at a time if needed. I loved this recipe, however, I had to double the amount of water. 31/2 cups left it a big dry burnt glob. I made it & used the water to oatmeal ratio that was on the box…..1 cup steel cut oats to 4 cups water…so I used the 2 cups oats & added 7 cups water. Perfect creamy oatmeal. It was delicious & I’ll definitely make it again. Thanks for the feedback on the recipe Christine. I just looked up the original notes on this recipe and somehow the water amount is indeed wrong and it should be 7 cups of water. I have edited the recipe to include the correct amount of water for the steel cut oats.